As an Oriental Trading Brand Ambassador we received products for review purposes. As always all opinions are honest and completely mine. JustaBXgirl loves watching people be crafty on YouTube. She used to just watch people customize Shopkins and horses but now she is into every type of craft she can find. One day she will watch someone create rainbow pencils and the next she will watch someone else create a doll house out of cardboard and paper. Unfortunately for her this mama, as you may know is not so crafty. I just don’t have the eye that sees a few sticks and blades of can throw together a centerpiece. Forget about me turning a sponge into Mona Lisa. But, since I do everything I can to keep my little smiling I look so crafts that even I can’t mess up. Thank you Oriental Trading Company for always having just what I need! Not sure if you know this but I have a HUGE family. Not joking. My mother is the youngest of THIRTEEN children. Don’t get me started on how many first, second and third cousins I have! Yup, I said third cousins. Anyhoo, my idea was to find a craft that JustaBXgirl could give to certain members of my family. Enter the idea to create DIY Christmas Ornaments. She seemed to be going along with my plan for a while. Even started creating ones with special charms and colors for certain titis (aunts). Then I stepped away to make dinner. All of a sudden she was bringing me ornaments and saying they were for this or that classmate. She was so excited to know which classmate loves the color blue and which doesn’t. Sorry titis, school friends have stolen your personalized ornaments. Don’t worry, they’ve taken mine too, even though there are only seventeen students (including her) in the class and two teachers. Apparently, some of JustaBXgirl’s friends need two! Really hoping she lets me keep at least one of the ornaments she crafted but I am also proud of her for wanting to give a bit of herself to her friends. I am always astonished at this giving soul I have been blessed with from God. A new girl was added to JustaBXgirl’s class today and she has already learned the little likes Kinetic Sand. So what does my little do? She tells me she wants to give the girl her purple Kinetic sand because she has more in other colors and she knows it will make the girl happy. Her compassion and empathy is something I hope she holds onto her entire existence. Just as I hope to be able to keep one of these ornaments she made on my tree for my entire existence. I think next year we will have an ornament making party because it is a really fun project. Maybe we’ll have two. One for JustaBXgirl and her friends and another for me and my friends. Oriental Trading Company really has everything you could need. 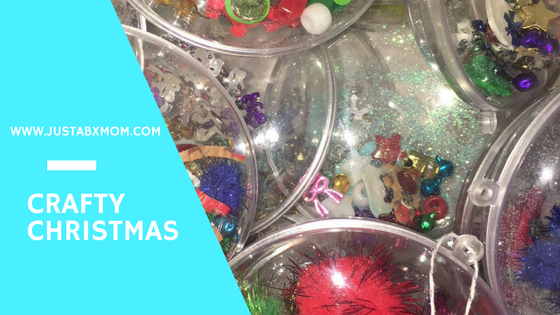 We got some DIY Clear Christmas Ornaments and lots of fun beads, bells, pompoms and lots of glitter! I really adore watching how JustaBXgirl’s creative mind works. I look forward to continuing to support her love for creative projects going forward and now it is easier to lead her towards fun-filled topics since we received our Oriental Trading 2018 Calendar. It has so many fun National Days that I didn’t know existed. Do you know there’s a Rubber Ducky Day? If you’re scared of crafts like I am sometimes then this is the type of thing for you. There’s no way to get this wrong! You can pick if your ornament will have five or fifty things inside. Either choice is correct because you make the art yours. This is great for anyone old enough to know don’t put things in your mouth! I also plan on getting more of these because they can honestly be used throughout the year and not just for Christmas.